midBit Technologies is the business name for Mark Chambers, an electrical engineer with over 30 years experience designing embedded computers for clients. I wanted a simple device for debugging ethernet links, which resulted in the SharkTap, and I decided to make the SharkTap available as a product. A Test Access Port (TAP) allows the engineer to view the data on an ethernet link. Packets flowing through the NETWORK ports are duplicated to the TAP port. The TAP port is typically connected to a PC running Wireshark. or similar software. The SharkTaps leverage the economies of scale of standard switch chips, allowing me to provide serious test equipment at a very attractive price. The switch chips in the SharkTap family support "port mirroring". I've waded through all the configuration options required to implement this reliably, so you just plug and play. The SharkTaps are what CISCO calls a SPAN port. They are sometimes also called aggregating taps, since both NETWORK ports are mirrored to one TAP port. 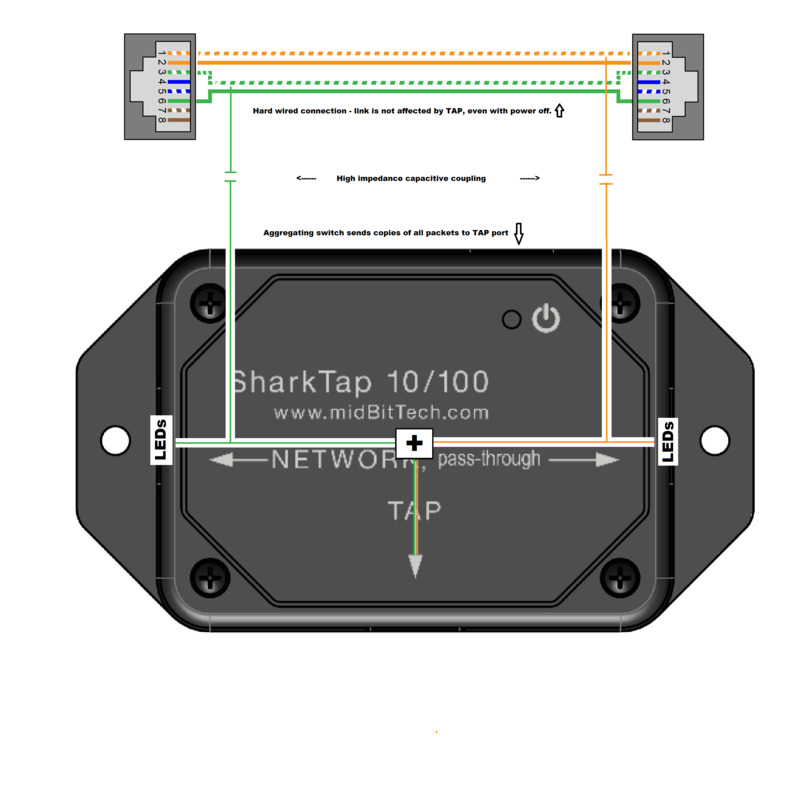 All SharkTaps also have "auto-MDIX" which means that you never have to worry about CAT-5 crossover cables. All ports will work with either a straight-through or crossover cable. 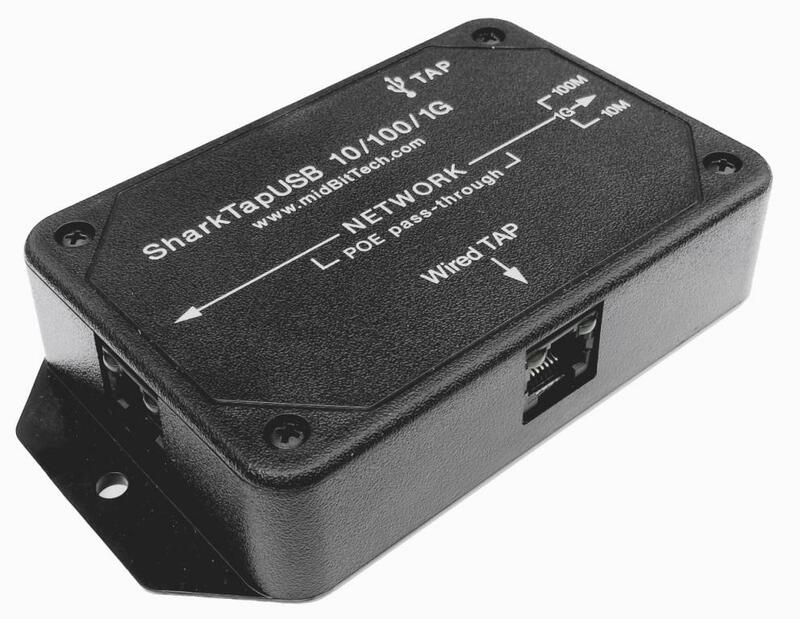 The SharkTap 10/100 allows you to monitor a 10 or 100Base-T Ethernet link. The SharkTap is powered by a micro-USB cable: Connect to any USB slot on your PC or laptop, or use a cell phone charger. 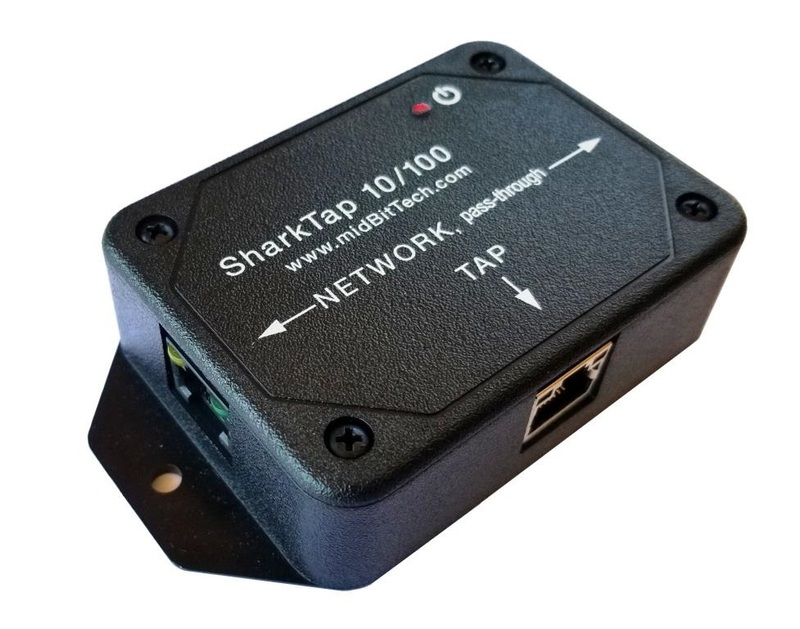 The second generation of the SharkTap 10/100 uses passive monitoring, so your network is untouched, even with power off. The two ethernet pairs are capacitively coupled and run through high impedance amplifiers (about 3K ohms) to a switch that aggregates copies of packets on both ports to a TAP port. So it's completely passive - no delays, no protocol dependencies, and no way for your investigations to cause a problem on the network link. No ethernet port? No problem! The newest member of the SharkTap family was designed to support newer portable PCs that don't have an ethernet port built in. But it turns out, even if you have an ethernet port, you may appreciate not having to switch your ethernet port between networking and debugging setups. The SharkTapUSB has all the features of the SharkTap 10/100/1G below, with the addition of a virtual ethernet port over the USB3 port. You can use a USB2 port, but with only 300-400Mbps throughput. Or you can use the Wired-TAP port with a standard ethernet port, with the USB connector only providing power, the same as the other two SharkTap members. The SharkTapUSB will even double as an ethernet adapter, minimizing the number of gadgets to carry in your toolbox. 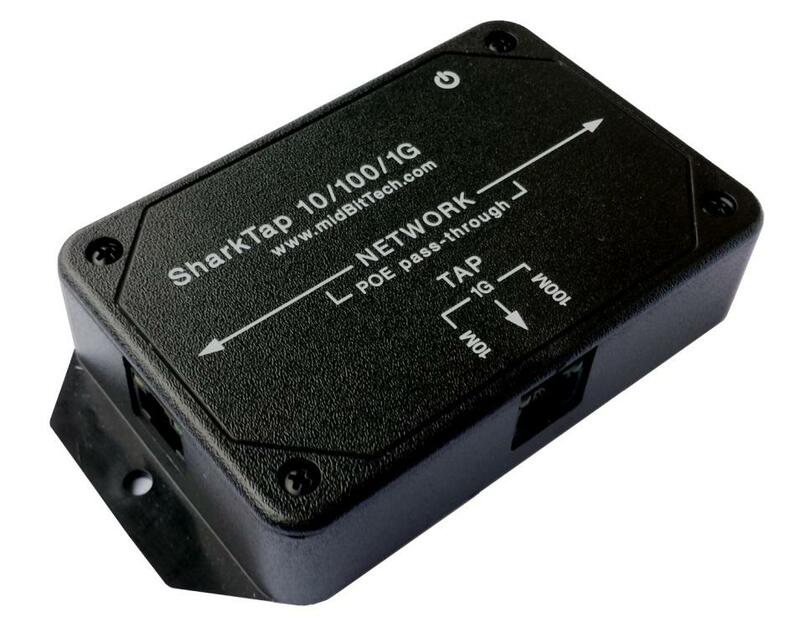 The SharkTap 10/100/1G Tap adds gigabit ethernet (1000Base-T) and Power-Over-Ethernet to the features offered by the original SharkTap (shown to the left).